Armstrong has replied on his Twitter feed describing the comments as "drivel"
(CNN) -- Lance Armstrong has hit back at Tour de France winner Alberto Contador by describing the Spaniard's latest criticism of him as "drivel" on his Twitter feed. 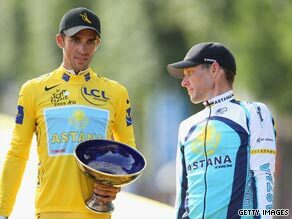 Lance Armstrong (right) looks on after Alberto Contador is handed the Tour de France trophy in Paris. The obvious tension between the Astana teammates dominated the headlines during the three-week stage race, with rumors rife of a division within the set-up. Contador eventually proved the stronger of the two riders, winning his second Tour in three years with seven-time winner Armstrong taking third place. But on his return to Madrid on Monday, Contador gave a press conference in which he was quoted as saying: "My relationship with Armstrong is nil. "He's a great champion, and he had a great race in this Tour, but it's something else on a personal level, where I've never had a great admiration for him, and I never will. "On this Tour there have been more tough days in the hotel than in the race itself." The American said: "Seeing these comments from AC, if I were him I'd drop this drivel and start thanking his team. Without them, he doesn't win." Armstrong re-tweeted: "A champion is also measured on how much he respects his teammates and opponents. There is no 'I' in team'. What did I say in March? Lots to learn." The rivalry between the two riders is likely to increase next year with Armstrong confirming he will leave Astana to head up the new Radio Shack team next season. Contador is also set to move teams after hinting he was unhappy with Astana's refusal to back him as leader above Armstrong before the race. Contador failed to clear up the rumors about his future on Monday, saying: "We will have to see what happens. I do not know where I'll go, but I am clear that it will be a team that is 100 per cent behind me." Contador eventually finished the Tour over four minutes clear of Luxembourg's Andy Schleck, with Armstrong -- who was riding in his first Tour since completing the last of his seven wins in 2005 -- a remarkable third. It was Contador's fourth successive grand tour victory, after he also won last year's Giro d'Italia and Vuelta Espana following the Tour organizers' decision not to invite the Astana team to the race in 2008.